Perhaps the nicest thing about our office space at Hilton Pond Center is the main room has a wall of glass patio doors that faces west and overlooks Hilton Pond itself. When we had to replace these doors last year, we also installed a big picture window over our computer desk, providing an unobstructed view that lets us feel as if we're sitting outside; it's sort of like having a high definition plasma television playing an unscripted, never-ending documentary about nature in the Carolina Piedmont. Numerous feeders just outside the office attract an constant parade of songbirds and hummers, and even after green-up in spring we can still see what's happening across nearly the entire surface of the pond. And don't forget those daily sunsets! Just now we're watching a couple of White-tailed Deer ambling across the dam on the pond's far side, and as they pass by a Wood Duck nestbox we can see a small bird going in and out of the entry hole on this large artificial cavity. 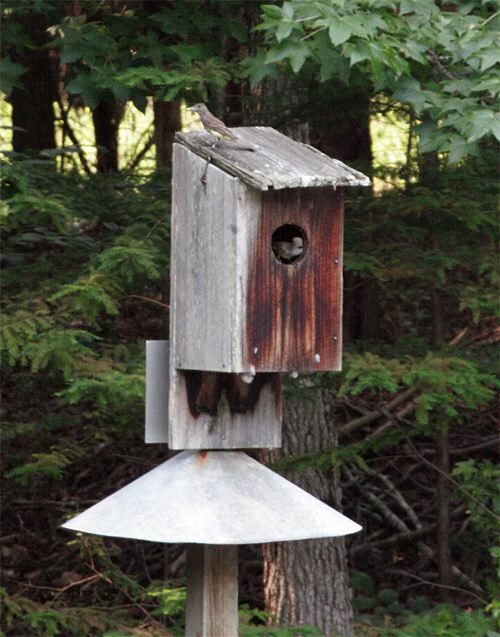 We first noticed this avian activity on 2 July, so we set up our spotting scope and confirmed our suspicion that the box--from which a Wood Duck mother had fledged a dozen ducklings 'way back in March--was now home to new tenants, a pair of Great Crested Flycatchers. Great Crested Flycatchers Myiarchus crinitus, occur around Hilton Pond only during warmer months; they're Neotropical migrants that breed in the eastern two-thirds of the U.S. and southern Canada and overwinter from Mexico south to Colombia. This species is of particular interest in the Hilton household because it was the first bird wife Susan identified on her own for her life list back in the mid-1970s. 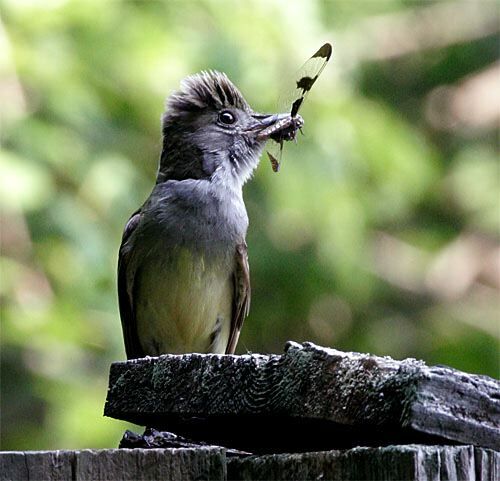 Now, some 30 years later, Great Crested Flycatcher have become the 25th confirmed nesting species at Hilton Pond Center. After 'scoping out the flycatchers at the Wood Duck box, we grabbed our digital camera, tripod, and 100-400mm telephoto zoom lens and set up a bit closer on the near bank of the pond. From there we fired off several shots that confirmed two birds were making frequent visits to the nest box--a sure sign there were chicks inside demanding their parent flycatchers provide a never-ending feast of succulent insects. As one of the adults prepared to exit the box, the second one sat on the roof and revealed an aluminum band on its left leg (above)--interesting because we haven't banded a Great Crested Flycatcher at Hilton Pond since mid-May 2004. 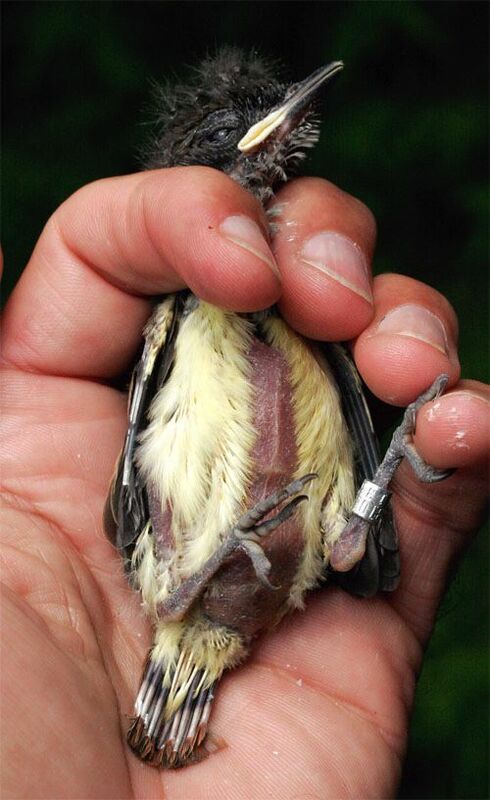 Although this species occurs each year at the Center, it spends most of its time up high in the trees and seldom comes to ground level where we can snare it in our mist nets; that's probably the main reason we've banded only 38 locally in 25 years. After successfully capturing the long-distance image above we decided to carry our gear even closer to the flycatchers. One of our trails circumnavigates Hilton Pond and goes across the dam--where we had seen the deer--and right past the nest box. As we worked our way around the pond on this path, we got occasional glances through vegetation and could see the adult flycatchers continuing their feeding visits. When we finally got to the dam's far end, we added a 1.4x telextender to our long lens, set up the tripod half-hidden behind a tree, and settled down to wait. In the canopy above us we could hear the adult flycatchers repeatedly making their distinctive and loudly whistled wheeep! call, a likely sign they were aware of our presence and a bit hesitant to come down to feed their offspring. After about ten minutes, however, the parenting instinct overcame suspicion as one of the flycatchers landed on top of the nestbox (above right). There was no question about the identity of this avian visitor. Chestnut edges on the wing feathers, gray throat and breast, lemon-yellow belly, broad flycatcher bill with tiny hook on the end, dominant rounded crest--all on a bird nearly as big as a Northern Cardinal. 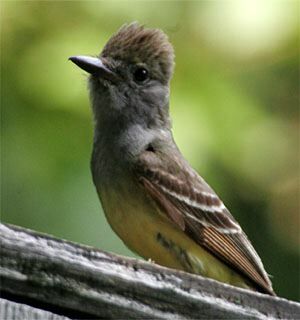 (Other southeastern flycatcher species are much smaller, so the "Great" in "Great Crested Flycatcher" pertains not to the height of the crest but the size of the bird.) While we took a few photos, the flycatcher hopped around on the nestbox--keeping an eye on us as it sized up the situation for several minutes before zooming out across the pond in pursuit of insects. When an adult flycatcher returned a few minutes later we were able to get some real insight into just what the bird was feeding its offspring. Our next photo (above) also provided a possible explanation for why our Hilton Pond dragonfly population was on the wane this summer, since the flycatcher was carrying a female Twelve-spotted Skimmer, Libellula pulchella, in its bill. 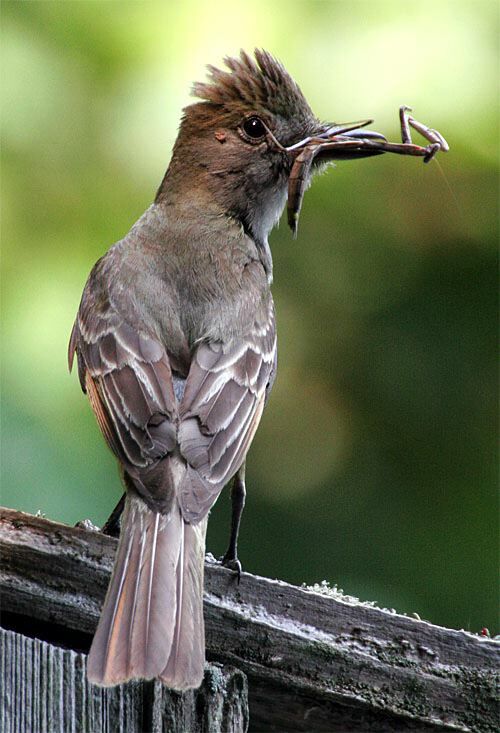 We can imagine that a pair of hard-working Great Crested Flycatchers could make a real dent in our small pond's dragonfly population, especially with a brood of fast-growing nestlings constantly begging for more. The dragonfly-slayer soon entered the nestbox with its prey and undoubtedly stuffed it into the crop of a nesting. When the adult departed we fiddled further with our lens set-up, replacing the 1.4X telextender with a 2X to bring the longest focal length of our zoom lens to 800mm--a pretty powerful setting since we were only about 20 feet from the nestbox. When an adult flycatcher returned a few minutes later with an even more interesting morsel of food, we're glad we had changed our lens configuration. Just as we were getting ready to move our photo equipment an adult flycatcher made another visit to the nestbox and perched on top long enough for us to take a few more shots. At first we thought the bird had collected a fat beetle grub (above right), but on closer examination of several exposures it looked more like the prey item was some sort of butterfly or moth. In any case, our three images above indicate a great diversity of food AND that this particular pair of Great Crested Flycatchers were pretty darned good at catching things other than flies. Having spent a couple of hours watching the flycatcher adults bringing home the bacon, we were curious about just what was in the Wood Duck nestbox that warranted such parental attentions. Thus, we returned to the Center's old farmhouse to change back into a pair of shorts and get a six-foot stepladder we then carried back to the end of the dam. We waded through knee-deep water, set up the ladder, climbed it, and peered in through the entrance hole of the nestbox. Sure enough, in a far corner we could see four nestlings cuddled together (above), their beady little eyes peering back at ours. The nestlings were heavily feathered, but with wing feathers still ensheathed and tails just coming in. When we opened the box from the top to let in some light we could see the adult flycatchers hadn't constructed much of a cup nest (above); in fact, it seemed as if they had simply moved in and laid eggs on top of the wood shavings and duck down feathers remaining from the previous occupant. 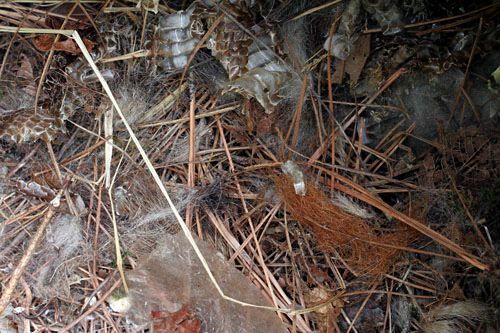 Scattered atop the shavings were quite a few pine needles, chunks of squirrel fur, and snatches of tan and brownish-red hair--perhaps from cattle in a nearby pasture. There was also a length of snakeskin--that signature item that adorns nearly every Great Crested Flycatcher nest--plus a piece of transparent cellophane that undoubtedly looked like snakeskin to the home-building flycatchers. We had brought bands and banding pliers when we fetched the ladder, so since the box was open and the chicks were old enough we decided to band them--mostly because banding young birds provides real potential for telling us a lot about longevity, site fidelity, migration, and dispersal. 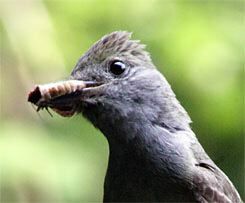 As is typical, the immature flycatchers had cloudy irises (above), large and soft yellow-white gapes at the corners of their mouths, and noticeably naked bellies where body feathers hadn't yet grown long enough to overlap; their legs, however, were already adult size and easily capable of supporting bands. Carefully gathering up each nestling, we placed a band on its leg and returned it to the group before getting another. While banding we noticed there was a somewhat smaller fifth nestling (left), off by itself in another corner. 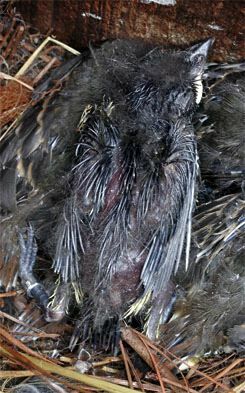 This youngster wasn't as developed as its four siblings--its wing, tail, and body feathers were still in quill--so it was either a runt that couldn't compete for food with more aggressive nest mates or it simply hatched a day or two later than they. Since it was alert and seemingly healthy and had big enough legs, we also banded this nestling and placed it with the others. Then we closed the box and retreated with the ladder to the farmhouse where we waited to see how soon the parent birds would return. 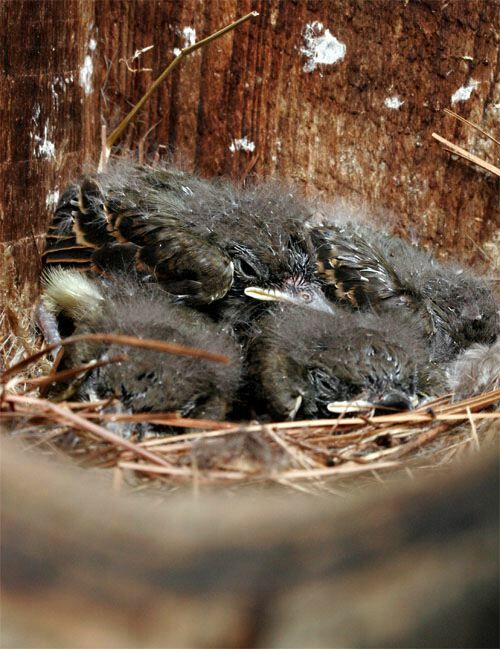 We're happy to say within five minutes both adult Great Crested Flycatchers were entering the multi-purpose Wood Duck box, each time bringing another high-protein snack for their five-chick family. This time next week the ravenous nestlings undoubtedly will be out flying around with mom and pop, creating a wheeeping! chorus at Hilton Pond Center as the fledglings learn how to fend for themselves. Click HERE for an enlarged version of the RTHU banding chart. --Over the past month or so, Hilton Pond Center has been taking calls and e-mails from across the eastern U.S. asking "What's happened to all the Ruby-throated Hummingbirds?" We always get these queries in June and July, and our typical response is that it is "normal" for RTHU populations to be "low" at this time of year. People often remember having lots of hummers in August and early September when many adults AND all the young birds-of-the-year are still present, so we usually suggest it's just a matter of waiting until numbers start to increase dramatically over the next few weeks. This year, however, we've heard even more cries from folks lamenting their lack of RTHUs, asking whether the devastating hurricanes in 2005 had an impact. We don't know the answer to this question. 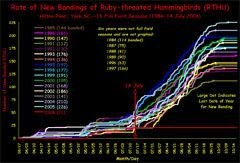 Some birds and habitats were lost, of course, but we won't know if 2006 is an aberrational year until the last RTHU has departed this fall. 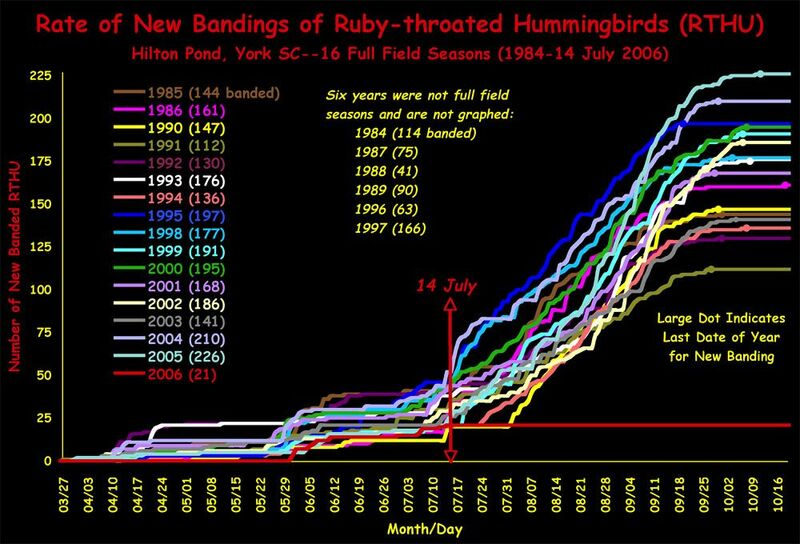 That said, the RTHU population at Hilton Pond Center is VERY low so far in 2006; through 14 Jul it was tied for second-WORST year for banding since we started our long-term study back in 1984 (see chart at left for relative banding rates for RTHUs over the past 23 years).